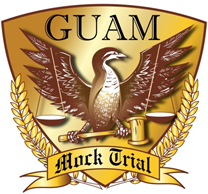 The District Court of Guam hosted two High School Mock Trial League Semi-final matches on March 20, 2018. First-seeded Notre Dame High School prevailed 3-1 in their match against fourth-seeded John F. Kennedy High School in the 4th-floor courtroom, while second-seeded Okkodo High School bested third-seeded St. John's School (2-1) in the 3rd-floor courtroom. Assistant Federal Public Defender Leilani Lujan, Assistant U.S. Attorney Belinda Alcantara, Assistant U.S. Attorney Marivic David, and Mr. Edward Platt Esq. joined Chief Judge Frances Tydingco-Gatewood and U.S. Magistrate Judge Joaquin V.E. Manibusan Jr. as judges in the event. Okkodo High School will take the role of the plaintiff against defendant Notre Dame High School in the championship match to be held at the Supreme Court of Guam on Thursday, March 22, 2018. Click here for team photos.